Alfred Roser was born in the 4th quarter of 1882 in Ewhurst, Surrey to labourer and gardener George Roser and servant and domestic caretaker Ellen Roser nee Tickner. Alfred’s father George Roser was born in the 3rd quarter of 1851 in Ifield, Surrey to agricultural labourer George Roser, born about 1813 in Lindfield, Sussex, and Sarah Roser, born about 1820 in Cuckfield, Sussex. 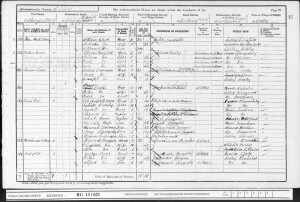 Alfred’s mother Ellen Tickner was born in the 1st quarter of 1854 in Ewhurst, Surrey to labourer Henry Tickner, born about 1815 in Wisborough Green, Sussex, and Rhoda Tickner, born about 1816 in Rudwick, Sussex. George Roser and Ellen Tickner married by Banns on the 5th of June 1875 at St Peter & St Paul’s church, Ewhurst, Surrey. At this time the couple lived in Ewhurst. George was working as a labourer and Ellen was a servant. Alfred Roser had one known brother: George Roser was born in the 3rd quarter of 1877 in Ewhurst, Surrey. He was baptised on the 1st of July 1877 at St Peter & St Paul’s church, Ewhurst, Surrey. At the time of the 1881 Census, the couple lived at Upper House, Ewhurst, Surrey. George was working as a general labourer and Ellen was looking after their son George. The family also comprised of Ellen’s father, a general labourer: Henry Tickner. Alfred Roser was born in the 4th quarter of 1882 in Ewhurst, Surrey and was baptised on the 29th of October 1882 at St Peter & St Paul’s church, Ewhurst, Surrey. At the time of the 1891 Census, the family lived at Upper House, Ewhurst Green, Ewhurst, Surrey. George sr was working as a general labourer, George jr was a telegraph messenger and Ellen was looking after Alfred. The household also comprised of Ellen’s father Henry Tickner and a lodger, farm labourer, John Jeal. 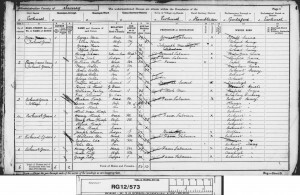 By the time of the 1901 Census, the family had moved to Redford, Ockley, Abinger, Surrey. George was working as a domestic gardener, Ellen as domestic caretaker and Alfred as a gardener. Alfred Roser married on the 9th of April 1904, Emma Jane King at St John the Baptist Church, Okewood, Surrey. At the time of the marriage Alfred was working as a gardener and the couple lived in Okewood. Emma Jane King was born about 1880 in Redhill, Surrey to labourer Stephen Thomas King, born about 1846 in Nutfield, Surrey, and Sarah Ann King, born about 1852 in Horley, Surrey. Emma Jane King was baptised on the 21st of March 1880 in Reigate, District of St John, Redhill, Surrey. At this time the family lived in Redhill. Alfred Roser had two children: Lilian Maud Roser born in the 3rd quarter of 1905 in Abinger, Surrey and Alfred George Stephen born in the 2nd quarter of 1910 in Abinger, Surrey. Lilian Maud Roser was baptised on the 13th of August 1905 at St John the Baptist’s church, Okewood, Surrey. At this time Alfred was working as a hay tier and the family lived at Wallis Wood, Oakwood, Surrey. 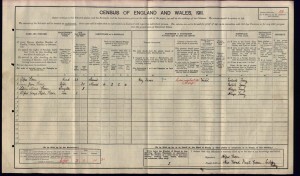 Alfred George Stephen was baptised on the 29th of May 1910 at St John the Baptist’s church, Okewood, Surrey. At this time Alfred was working as a labourer and the family lived at Forest Green, Okewood, Surrey. 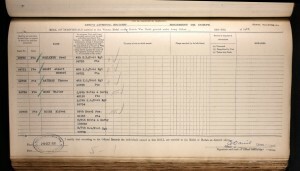 At the time of the 1911 Census, the family lived at New Road, Forest Green, Ockley, Surrey. Alfred was working as a hay trusser and Emma Jane was looking after their children Lilian Maud and Alfred George Stephen. The accommodation had five rooms. 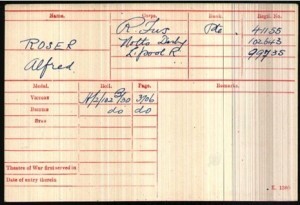 Alfred Roser enlisted into the Army in Horley, Surrey. At the time of enlistment he resided in Horley. 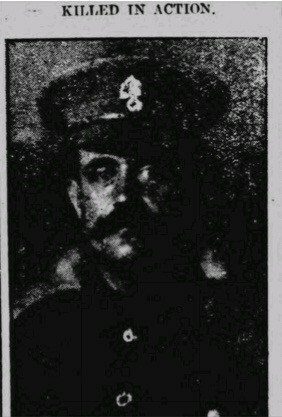 He joined the 26th Battalion, the Royal Fusiliers in May 1916. He was a private with a regimental number 41155. 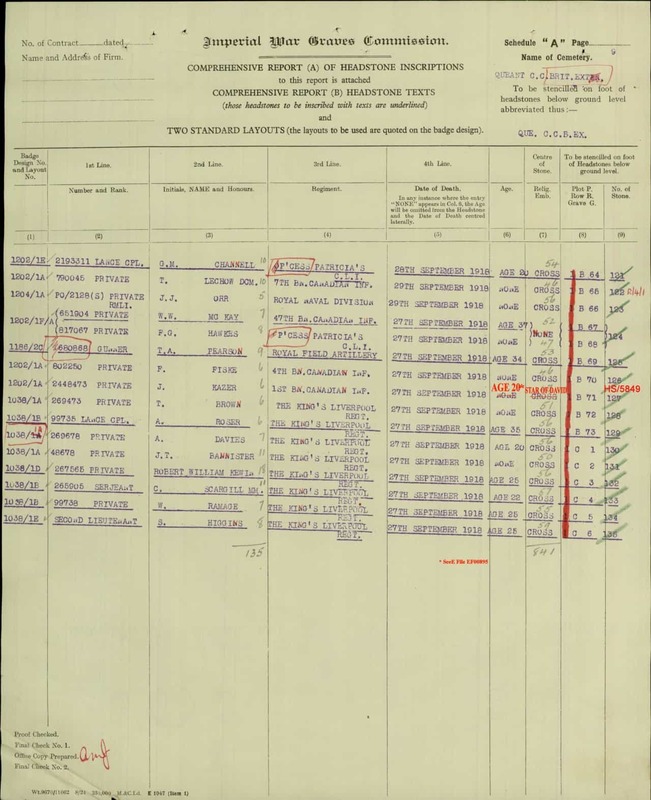 Alfred was also part of the 2nd/5th Battalion, the Nottinghamshire & Derbyshire (Sherwood Foresters) Regiment. At this time his regimental number was 102643. He was still a private. He disembarked in September 1917 to France. At Easter of 1917 Alfred came home, suffering from trench fever. He returned to France five months later. 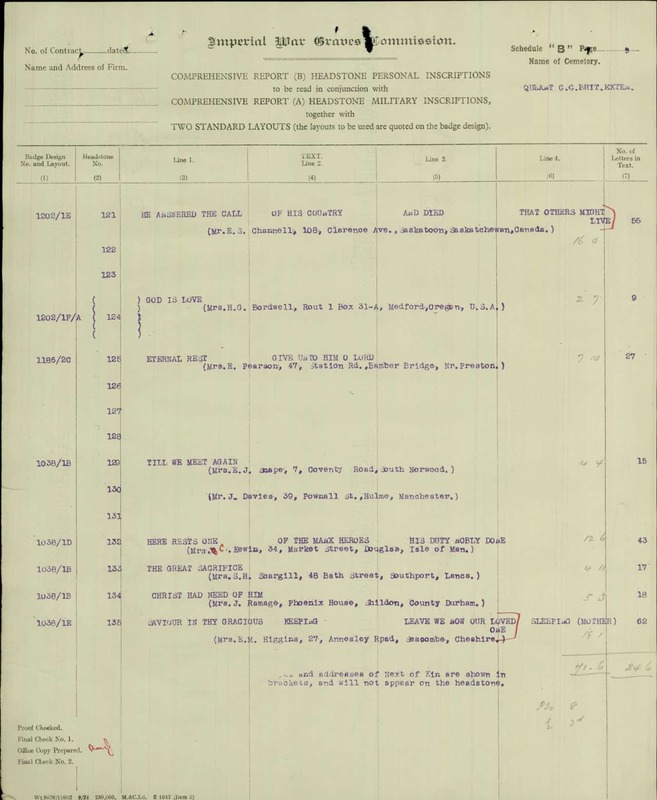 He was then transferred to the 2nd/7th Battalion, the King’s (Liverpool Regiment). 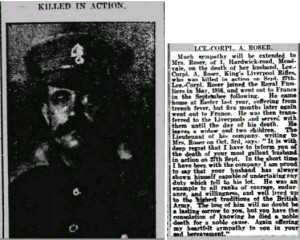 Alfred Roser died in an action on the 27th of September 1918 in France. 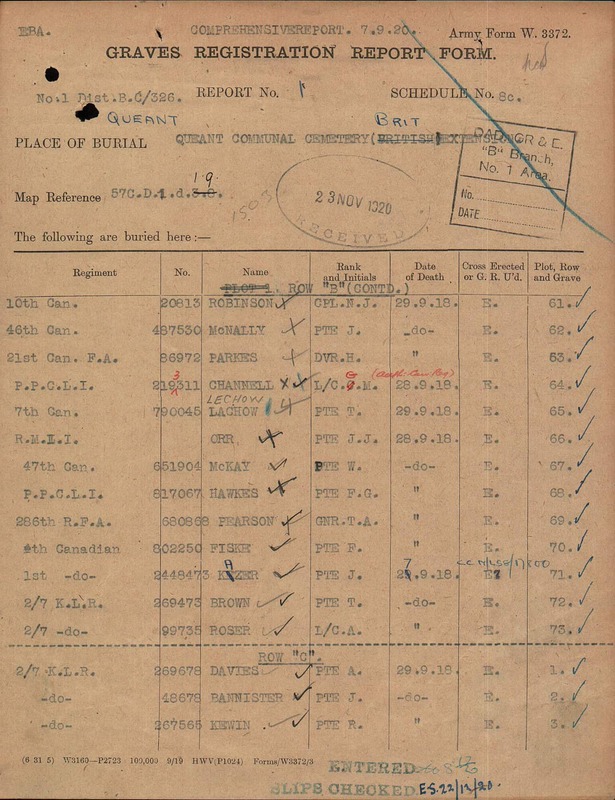 He is buried at the Queant Communal Cemetery, British Extension in France. His grave reference is: B.73. The headstone bears an inscription: “Till We Meet Again”. Alfred is also commemorated at the Forest Green Memorial. At the time of his death, his young widow, Emma Jane Roser lived at 1 Hardwick Road, Meadvale, Redhill, Surrey. Later, she moved to 7 Coventry Road, South Norwood in London and re-married in the 1st quarter of 1921 Edwin J. Snape. She received £2, 15s and 9d on the 31st of March 1919 and further £11 later in Soldier’s Effects. Alfred Roser received the British War and Victory medals.